Hey guys, I have a new giveaway for you! This time two lucky winners (U.S. only) will win one of two prizes from the revolutionary skincare line Dermacyte. The first winner will receive the NEW Oxygenating Eye Complex and the second winner will receive the Oxygen Concentrate! I’m beginning to get lines under my eyes – need to start taking care of them! Dermacyte Oxygenating Eye Complex and Dermacyte Oxygen Concentrate and one of the products that i might like to try, because i’ve being using some skincare which haven’t done much to what i want or expected it to do. they seem very dramtic to use and they also come in handy. it would easy for me to carry especially the type of person like me who usally go to sleep overs. I would love to win it because my skin gets very dull in the winter and I’d like to keep it bright looking! My reason is I’m getting old. I need Dermacyte Oxygenating Eye Complex and/or Dermacyte Oxygen Concentrate because I’ve been really tired lately and my skin could use the extra oomph!! I am showing signs of aging especially in the eye area….and I’m the mom of teens, who doesn’t use great skincare products :)We have lots of acne products in the house, but, no anti-aging though. Thanks! I’m a new mom, and I need something to help my dull skin! I have dark circles and wrinkles under my eyes. I don’t want to have tired-looking eyes anymore. I don’t think I’ve glowed in years! Sounds amazing! Allergies and being in 50s make the possiblity of receving eye and face makeup which hide puffiness and make the sallowness of the skin appear better in color sounds extremely exciting. Please allow me to win. I am staring to see wrinkles under my eyes, so would love to give this a try. I need to get rid of as many wrinkles as I can! I need it because my skin oft looks dull. Between the dark circles and light lines showing up. I could definitely use a little help. I need this because I am Asian and everyone is always saying Asian women look young, but now I’m fifty and starting to show bags, sags, lines, so I need these products to keep up the tradition! Two kids, one dog, one cat, two … — wait a minute is that ONE comment or does it count for a bunch of reasons why my eyes need help? A tough few months has brought some new bags and wrinkles under my eyes, need to stay on top of those! I need this desperately because the school year has begun again. I would love to look fresh and energized. Point blank: I could use refreshing, rehydrating and restoring! 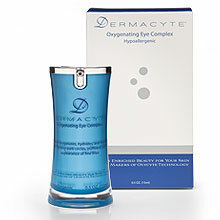 Dermacyte Oxygenating Eye Complex and Dermacyte Oxygen Concentrate sound like just the map to the fountain of youth! Thanks for this fantabulous giveaway! I would love to try either of these, but there is no way I can afford them on my budget. I’m getting laugh lines (or, honestly, I have them “real good” now. 😉 ). I would like to prepare my skin for the anticipation of the coming winter. I’m starting to get bags under my eyes. I want to lesten the discoloraztion in my skin. Thanks! I wake up looking like I belonged to a pack of raccoons. My eyes are inset so when I smile it always leaves large dark bags under my eyes. I need to brighten these puppies! I want these because my eyes are starting to show their age! Just turned 60….need I say more??? Old Haggage…..is that a word? I ordered Dermacyte Oxygen Concentrate and Eye Complex after receiving a packet of free samples and liking the hydrated appearance of my skin after using it. (It lasts a long time, not just a few minutes.) My skin is always red and rough because I have rosacea, so I am always looking for a product that will help. The product cost more than I usually spend. But since using it for the last two weeks, my skin is smoother than it has been for months. The product is very, very light and completely non-greasy. When I put it around my eyes it doesn’t create that shiny, aging look that you get with other products. If you can only start with one, get the eye treatment. It shows immediate results and does not cause any watery reaction or redness. « Anne Gets A Pixie? » How To: Go From Rough To Glam!